Some activists are hoping to undo the state transgender antidiscrimination law through a ballot question. 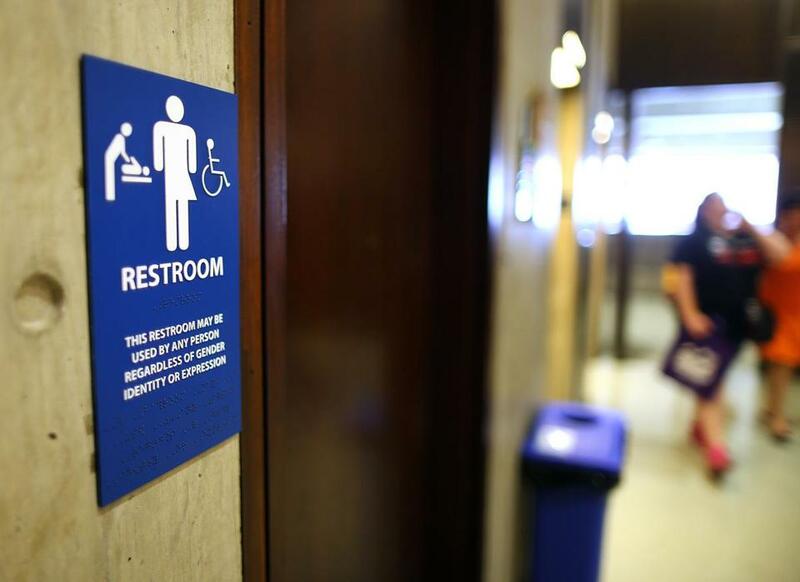 A first-of-its-kind study being released Wednesday refutes the premise that the state’s transgender antidiscrimination law threatens public safety, finding no relation between public transgender bathroom access and crimes that occur in bathrooms. Researchers at the Williams Institute, a think tank focused on gender identity at the UCLA School of Law, examined restroom crime reports in Massachusetts cities of similar size and comparable demographics and found no increase in crime and no difference between cities that had adopted transgender policies and those that had not. The data were collected for a minimum of two years before a statewide antidiscrimination law took effect in 2016. Activists who want to undo that state law through a ballot question in the Nov. 6 election have focused their campaign message on bathroom safety concerns. They suggest that a new right for transgender people infringes on everyone else’s privacy rights, and could be abused by men who want to prey upon women and children in ladies’ rooms. The vote is being closely watched nationwide because it offers the nation’s first public referendum on transgender rights in the state that first introduced gay marriage. Transgender activists bristle at the idea that the campaign casts them as potential sexual offenders and have argued that there is no evidence that the law threatens anyone’s safety. A spokesman for the Freedom for All Massachusetts campaign, which is working to preserve the law, said the Williams Institute study reaffirms that stance. “It really takes the wind out of the sails of our opponents who have been trying to paint this false picture,” said spokesman Matthew Wilder. Yvette Ollada, a spokeswoman for the “Vote No on 3” campaign, said she could not speak to the study before reviewing it, but she questioned its objectivity since the opposing campaign was anticipating its release. “If it’s unbiased, wouldn’t they send it to both campaigns?” Ollada said. The Williams Institute studies gender identity and sexual orientation, but the lead researcher maintained that its work is not always positive for the LGBTQ community. The peer-reviewed study, published in Sexuality Research and Social Policy, focused on the years before Massachusetts adopted a statewide law prohibiting discrimination in public accommodations based on gender identity. Prior to that time, select municipalities had adopted local ordinances that had a similar effect: allowing transgender women into ladies’ rooms and transgender men into men’s rooms. Under the 2016 Massachusetts law, any public place with separate areas for men and women must let people use the space consistent with their gender identity — a term that refers not to their biology, but to their sincerely held gender identity, appearance, or behavior. The activists who want to repeal the law say it could be abused by male predators and threaten privacy and safety of women and girls. But until now there has been no empirical data to bolster or negate their concerns. To establish the scope of the issue, researchers used public records requests to obtain police incident reports and compare bathroom crime data in cities with antidiscrimination laws — Medford, Melrose, and Newton — with comparable towns that lacked them. They paired each city with communities that were comparable based on a host of data, including crime and population demographics, poverty, and voting trends. Medford was compared to Beverly and Watertown; Melrose was compared to Beverly; and Newton was compared to Brookline and Arlington. Then, rather than looking at numbers alone, the researchers compared the differences in each locality over time to judge whether a change in bathroom crime could be attributable to the enactment of a transgender accommodation law. “We did pretty much the most comprehensive study you could do for the state of Massachusetts,” said Hasenbush . The study notes its limitations — largely on the quality of the data. Each police department had a different system for record-keeping; some were able to search manually, some electronically, and the researchers had to review the records to identify the incidents. Still, researchers concluded that there was no statistically significant relationship either in the number of crimes occurring in any individual locality with a transgender accommodations law or in comparison to its matched pair. In fact, the average number of restroom incidents was higher in localities without transgender accommodations laws. That’s not to say that incidents don’t ever happen, however, the authors note. Beyond the study, police departments report that they are seeing more “peeping Tom” cases — a factor they attribute less to gender politics than to advancing technology and the tiny cameras that are increasingly being used to spy on women in bathrooms. In June, a woman reported that a man seemed to be using a pen-like device to videotape her through a hole in the wall of a bathroom at the Garment District, the resale clothing store near Kendall Square, said Cambridge police spokesman Jeremy Warnick. Police were able to identify, but not apprehend, a suspect. However, anecdotal reports of crimes in bathrooms seldom involve suspects who are — or are pretending to be — transgender. And anyone, regardless of gender identity, can be arrested for criminal activity in a bathroom, Wilder said. Stephanie Ebbert can be reached at Stephanie.Ebbert@globe.com.